Every January and February I have to travel for several weeks for work. 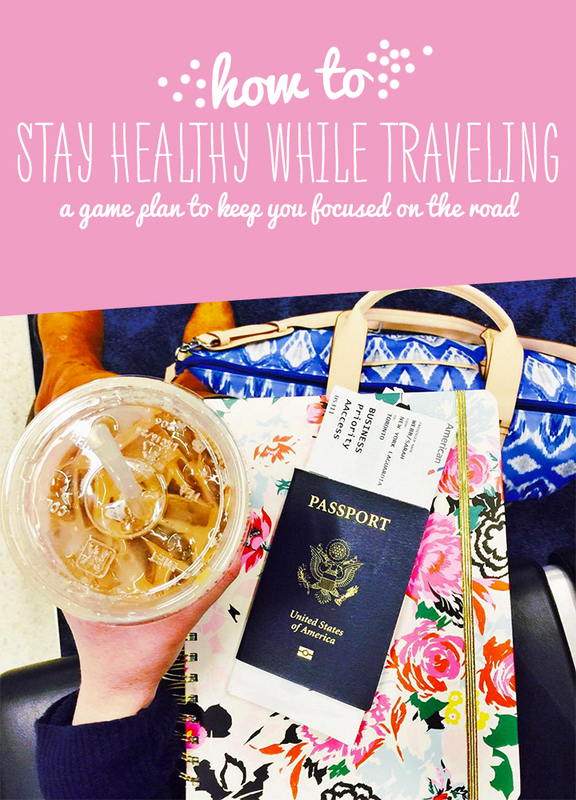 I always start my trip trying to figure out how to stay healthy when traveling. I'll say, "I'm going to stick to my diet for the whole time. Only salads!" In my 5 years with this company, this approach has yet to work. By lunch on day one I'm generally eating a double cheeseburger and fries, convinced I'm surely dying from starvation. I'm not going to be unrealistic this trip. I'll be in Miami for 10 days, and if I tell myself I can't have something, it will be all I think about. Instead, I'm making a plan and ditching the all-or-nothing approach that has so regularly failed me in the past. I'm going to outline my plan below, in hopes that it'll help me stay focused, but not deprived. This won't be an all-or-nothing approach, I'm not going to restrict myself to only salads, because that just isn't realistic. With that said, I also need to remember that this trip is in no way a vacation. I shouldn't be able to use the excuse, "Whatever, I'm on vacation!" No, I'm at a 10 day work trip and I need to stay focused with my eye on the bikini body prize. My bestie Magen gave me a S'well water bottle for Christmas and I'm nothing short of obsessed with it. Whenever I'm on these trips, water never seems to be readily available but diet cokes are EVERYWHERE. I actually like and drink lots of water in my normal day, so I'm hoping having an easy bottle that I can refill will keep me away from the DC! I always say, oh I'll go to the gym in the hotel. Well, that's fine and good... and I MIGHT go once if I'm lucky. Instead of committing to going to the gym, I'm going to commit to running/walking outside. It's February in Miami for pete's sake. I'm going to take my C25k app and hit the pavement 5 times. That's my goal, 5 times. I'm not sure what it is about these boat shows, but I get savagely hungry. I'll be standing there at 11am and I feel like my stomach will literally begin eating itself and I will pass out and die if I don't eat 48 slices of pizza, stat. In the past, my plan when I get that hungry, that early is to just wait it out until at least noon. By then though, I'm so hungry I really do eat 48 slices of pizza. Ok fine, it was just 44 slices. Not this trip. The second I feel hungry, I'm not going to deprive myself. I'm going to eat. I'll make my boss take us to the grocery store on day one and I'll pack oranges, apples and carrots each day, and I'll eat as much of those kinds of items that I want. I'm pretty sure none of us got fat from eating too many orange slices. So, If I'm hungry, I'll eat. This feels very wasteful to me, so I'm reluctant to even write it. Our meals are all paid for on this trip so we won't exactly be skipping dinner and eating leftovers the next night. I am going to list this tip though because I follow the Skinny Confidential and she always talks about doing this. I would be totally fine to have a body even remotely like hers, so she must be on to something with this tip. If I make a bad choice -- I know damn well I'll get the fish and chips in Miami because that's my kryptonite there -- I'm automatically going to move half to the side and simply indulge, enjoying the other half. Again, since meals are paid for, most of the guys I travel with opt to go out to breakfast each day. I am going to decline that option on this trip. I don't need a hotel breakfast buffet seeing as I'll be hungry again around noon, regardless if I just eat a breakfast bar or if I stuff myself with bacon, eggs and a short stack. Plus, then I get to sleep later #winning. Great tips! It's always SO hard to stay healthy on trips. I usually only travel for vacations, and I definitely have a sort of "Yolo" mentality on vacation. Oh also, S'well bottles are AMAZING! Having lots of healthy snacks and water always on hand really helps me not want to reach for the less health option. 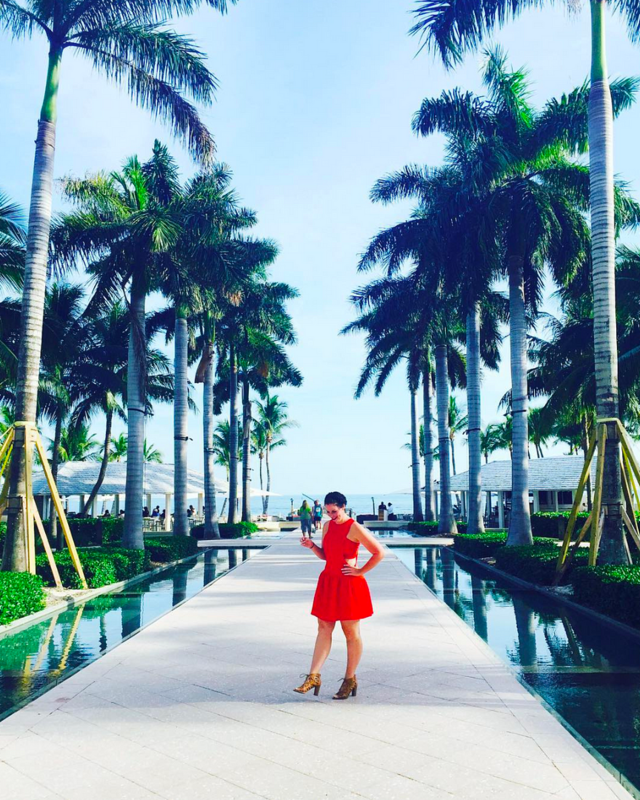 Lots of great tips, running in Miami sounds so nice right now as I prepare to go out running in the snow! Always bring you own water bottle. That is the best thing. Also, take a day after work to relax and not go out. These are great tips, especially to eat when you're hungry! That's true of eating in general...denying yourself is never going to work out. This is great timing for me! I've not traveled for work until now and I'm about to leave for a 3 week trip. I'd like to think I will eat healthy, but c'mon, a per diem! I can eat like a queen! I will try to keep these tips in mind so I don't come home 20 pounds heavier. These are great tips! I always struggle with staying healthy when I travel. This post speaks RIGHT to me and in fact I have this same topic on my upcoming blog posts list. The part about skipping meals and eating leftovers, YES. I travel for work a ton and all meals paid my boss feels like we have to eat huge, over the top meals EVERY meal. Ah it is so hard! Good luck, stay strong! You should eat lots and lots of protein! Eggs and oatmeal in the morning (oatmeal will keep you feeling full longer), chicken/turkey and veggies at lunch and something protein filled for dinner! With snacks in between. I eat SIX meals a day (though I'm training for a competition), but still, I focus on proteins, good fats, and carbs (which are NOT the enemy!). wow! that is some determination to say no to the hotel breakfast- you are killing it! these tips are awesome. YES to the water bottle! And if I'm holed up in my hotel room and ordering room service, I will order from the kids' menu; it's cheaper and the portion sizes are better. Also, if I need caffeine, I have unsweet iced tea these days. Great tips! I adhere to the fruit within arms length and water bottle tricks when I'm traveling too. My typical to-to travel rule is everything in moderation - this way you're not depriving yourself but you're also not relying on the "I'm on vacation, whatever" trap. Good luck and enjoy Miami! These are such, such good tips especially water and portion control! #2 - When I have traveled and taken my leftovers to go with no plan for eating them, I just hand them off to a homeless person I walk by. They are always very appreciative and my food doesn't go to waste.